Welcome to our website at the City of Ottawa. Whether you are a resident or visitor, I hope you find our site helpful. On behalf of my City Council colleagues, we are proud to serve the residents of Canada's Capital during this term of council. Our city of over 900,000 residents is blessed with the best of many worlds: Great urban neighbourhoods; rural villages and dynamic suburban communities. We are also fortunate to have one of Canada's most highly educated and talented workforces, and home to one of Canada's largest concentrations of hi-tech firms. Ottawa is also Canada's largest rural community, home to hundreds of innovative and productive farms. Visitors and residents alike are treated to both national and local arts and cultural institutions that we are very proud of. To our visitors, welcome and thank you for visiting. We hope you will consider Ottawa your second home town. To our residents, it is an honour to serve as your representative and please feel free to contact me or your City Councillor if we can be of service to you and your family. 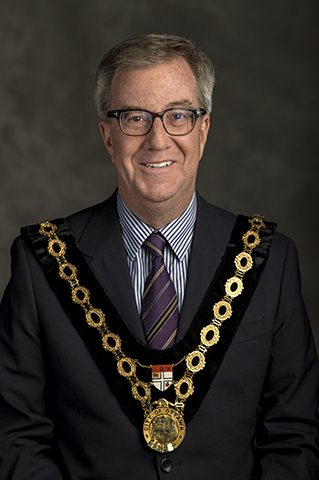 Jim Watson was re-elected as Mayor of the City of Ottawa for a third consecutive term on October 22, 2018 with more than 71% of the popular vote. Mayor Watson has dedicated most of his career to public service in Canada's capital. First elected as a Councillor in 1991, he was re-elected in 1994. Three years later, he was elected as the youngest Mayor in Ottawa's history with 82% of the popular vote. Following the amalgamation of Ottawa and surrounding communities, Mayor Watson was appointed the President and Chief Executive Officer of the Canadian Tourism Commission, a federal crown corporation. In 2003, he was elected as the Member of Provincial Parliament for Ottawa West-Nepean and immediately appointed to cabinet as Minister of Consumer and Business Services. In 2005, he was appointed as Ontario's first Minister of Health Promotion and he successfully implemented the Smoke Free Ontario Act. Re-elected as MPP in 2007, he was promoted to Minister of Municipal Affairs and Housing. In that portfolio, Watson signed the largest federal-provincial housing agreement in Ontario's history. In addition, he co-authored a historic agreement between the Province and Ontario's 444 municipalities that saw over $1.5 billion in social service costs removed from local property taxes. Following his time in provincial politics, Jim Watson returned to municipal politics and was elected as Mayor of the City of Ottawa in October 2010. In his first term as Mayor, Watson oversaw the beginning of construction of the Confederation Line light rail transit project and the successful completion of the Lansdowne Park redevelopment. He brought renewed fiscal discipline to City Hall, bringing in the lowest tax changes for several years while investing in renewed infrastructure, new community facilities and transit improvements in all parts of the city. Mayor Watson’s first term saw the creation of Invest Ottawa, the opening of the Shaw Centre, the EY Centre, the revitalized Lansdowne Park and TD Place, the Vimy Memorial Bridge, the Richcraft Sensplex East, Minto Recreation Complex – Barrhaven, the Francois Dupuis Recreation Centre, and the Richcraft Recreation Complex – Kanata. During his second term, Mayor Watson continued to move the City forward and oversaw important city initiatives such as the Innovation Centre at Bayview Yards, the new Ottawa Art Gallery and the revitalization of Arts Court, the Ottawa River Action Plan and the unforgettable Ottawa 2017 celebrations, which marked Canada’s 150th anniversary. Mayor Watson was instrumental in securing of provincial and federal funding for Stage 2 LRT, which will bring rail farther west, east and south. An active member of his community, Watson has served on the boards or as honourary chair of several community organizations, including the Riverside Hospital, the National Arts Centre, the Christmas Exchange of Ottawa, the Forum for Young Canadians, Invest Ottawa and Ottawa 2017. In 2016, Mayor Jim Watson was appointed to the National Capital Commission (NCC) Board as an ex-officio member, becoming the first Mayor of Ottawa to ever sit on the Board of the NCC. He served as chair of United Way's 2002 campaign, which raised a record $21 million. An avid volunteer with several groups, he has helped serve meals at the Shepherds of Good Hope, a local soup kitchen. His commitment to those less fortunate was evident when, in August of 2000, he contributed his entire municipal severance payment of $31,000 to Ottawa's Union Mission for Men. His years of active involvement and community service have made him the recipient of several awards and accolades, including Maclean's magazine's "100 Young Canadians To Watch," Carleton University Honours Award, the City of Ottawa's highest civic honour, the Key to the City; the Queen's Golden Jubilee Medal; the Visionary Award by the Ontario Pharmacists' Association, and the National Leadership Award by the Canadian Council for Tobacco Control for his role in implementing the Smoke Free Ontario Act. Mayor Watson was recognized for his support of the tourism industry by being named Ottawa Tourism Leader of the Year in 2012. In 2013, he was recognized by the Canadian Housing Renewal Association for his work on breaking the cycle of poverty. In 2014, Mayor Watson was named “Communicator of the Year” by the International Association of Business Communicators’ Ottawa chapter. In 2016, he was presented with the Water Leader Award by the Ottawa Riverkeeper, for his persistent leadership to prioritize the City's efforts to clean up the Ottawa River.